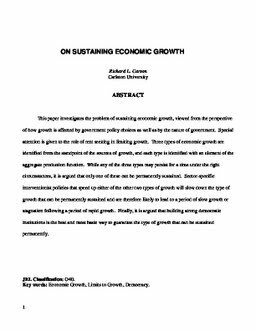 This paper investigates the problem of sustaining economic growth, viewed from the perspective of how growth is affected by government policy choices as well as by the nature of government. Special attention is given to the role of rent seeking in limiting growth. Three types of economic growth are identified from the standpoint of the sources of growth, and each type is identified with an element of the aggregate production function. While any of the three types may persist for a time under the right circumstances, it is argued that only one of these can be permanently sustained. Sector-specific interventionist policies that speed up either of the other two types of growth will slow down the type of growth that can be permanently sustained and are therefore likely to lead to a period of slow growth or stagnation following a period of rapid growth. Finally, it is argued that building strong democratic institutions is the best and most basic way to guarantee the type of growth that can be sustained permanently. Keywords Economic Growth, Limits to Growth, Democracy. Carson, R. L. (2007). On Sustaining Economic Growth (No. CEP 07-09). Carleton Economic Papers (CEP). Department of Economics.